Mangaluru, July 03, 2018: Pope Francis appoints Rev. 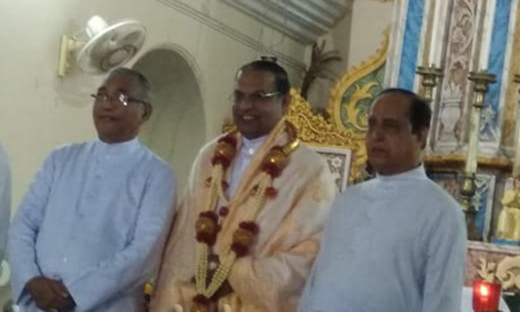 Dr Peter Paul Saldanha as the 14th Bishop of the Diocese of Mangalore. Bishop Aloysius Paul D’Souza announced the appointment of Dr. Peter Paul Saldanha at the Bishop house, Kodialbail, Mangaluru. The official announcement of his appointment was simultaneously done in Rome , Delhi and in Mangalore at 3.30pm on July 03, 2018 . In Mangalore, Most Rev Dr Aloysius Paul D’Souza made the official announcement at Bishop’s House. The outgoing Bishop Aloysius Paul has served the Diocese for 22 years. Rev. Dr Peter Paul Saldanha hails from Kirem, near Kinnigoli. He was born on 27th April 1964. After the initial studies in his native place, he joined St Joseph’s Seminary Jeppu and did studies in Philosophy and Theology. He was ordained at Bejai Church by the then Bishop Rt.Rev. Basil D’Souza, on May 6, 1991. 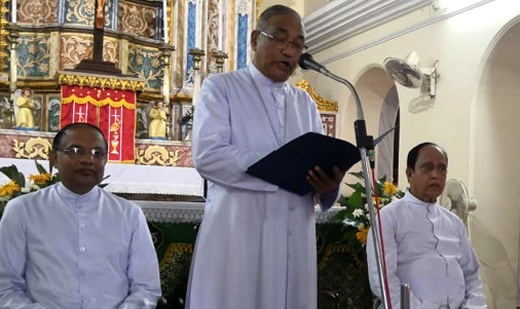 He earned the first rank in the Bachelor of Theology degree and briefly served as an Assistant Parish Priest at Moodubelle parish (now Udupi diocese) and in Milagres Parish, Mangalore. In 1996 he was appointed professor at St Josephs Seminary Jeppu, Mangalore. Later he went to Rome for higher studies in Theology and obtained Doctorate in Dogmatic Theology. Since 2010 he is Proffessor of Dogmatic Theology at Pontifial Urbanian University, Rome. In Rome he earned a Licentiate and Doctorate in Biblical Revelation in 2001 and 2005 respecti-vely from Pontifical Urban University, (Pontificia Universita Urbaniana), where he has been on the faculty for a long while now. Rev Fr. Peter Paul Saldanha has been a self effacing priest of Mangalore, held in high esteem and awe among scholars and his students in Rome and many at home. Approachable, jovial with humor to rule and unassuming, down to earth, his special quality is being a good listener ready to hear anyone with a need. A book he has authored has made waves in many a circle. Titled "The Church: Mystery of Love and Communion", the subject reveals the depth and commitment he has for the church and people.